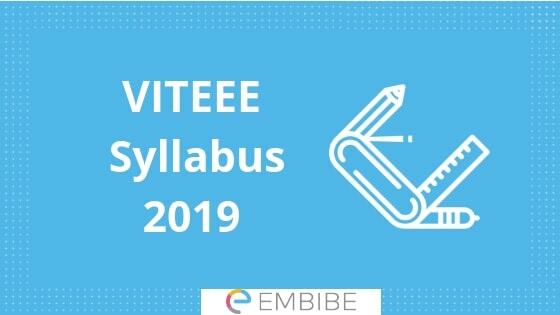 VITEEE Syllabus 2019: The first step towards preparation is to understand the VITEEE Syllabus completely. VIT University is the main authority which organizes a university level entrance examination. This examination is known as the VIT Engineering Entrance Examination (VITEEE). This exam will be organized in 118 cities across India and abroad (Dubai, Kuwait, and Muscat). The exam will be organized into the online mode. VIT University will conduct VITEEE 2019 online from April 10 to April 21, 2019. The VITEEE Syllabus will help the candidates in preparing for the exam in a better and organized way. Through the VITEEE Syllabus 2019, the candidates will be able to know more details regarding the mode of exam, duration, sections, the total number of questions, marking scheme etc. As per the latest VITEEE Syllabus 2019, the entrance test will be conducted in the online mode in 3 sessions in different slots. a) The exam will be conducted through online mode (Computer Based Test). b) The question paper will be asked in the English Language. c) The questions will be Multiple Choice Questions (MCQ). d) Total of 125 questions will be asked in the examination. f) The duration of this exam will be 2 hours 30 minutes. g) The exam will be organized 3 sessions per day (Session I – 9:00 AM to 11:30 AM), Session II – 12:30 PM to 3:00 PM) & Session III – 4:00 PM to 6:30 PM). h) For each correct answer, one mark will be allotted. i) There will be no process of negative marking. The university has released the official syllabus for VITEEE 2019. According to the latest VITEEE Notification, the syllabus of the examination is comprised of Physics, Chemistry, Biology, Mathematics & English subjects. The question comes from the Central Board of Secondary Education (CBSE) & State Board of Higher Secondary Education. Here we have mentioned the official VITEEE Syllabus 2019. Candidates must follow the VITEEE Syllabus and plan their VITEEE study plan accordingly. It will also be beneficial if they practice and take tests online as the VITEEE Exam is conducted only in the online mode. Watch out for the latest updates that we share regularly on Embibe.